IT masters: Lucas Want and Braeden Gates built a website that helps fellow students solve their IT problems. “WE are straight on to it because we know ‘you’ need to get back-up online as soon as possible” – the words students want to hear from the IT department or Help Desk when an Internet problem arises. 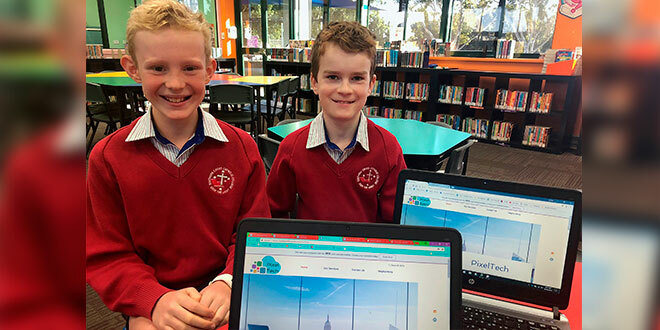 However, at Southern Cross Catholic College (SCCC) it was Year 6 students Lucas Want and Braeden Gates who were providing the solution to IT problems of fellow students. The boys, both students at the Kippa-Ring campus, created a website for their classmates to help them negotiate the myriad of IT issues they encounter while working on their laptops in the classroom. The desire to help their fellow classmates was the inspiration for the website creation. “We really like to help others and, because we had a bit of background knowledge, everyone was coming to us asking us for help,” Braeden said. Lucas and Braeden developed the website over five weeks working in their own time during lunch breaks in the library. The boys have covered issues regarding school portal access, printing issues, Internet access and log-on issues. When students have an IT problem they can look for a solution already on the website or if new issues arise, the boys post a new blog with a resolution to the issue. Principal Brett Horton said Lucas and Braeden saw a need and did something about it. “This is not a result of the teaching of assessment; it is just from the need of classmates asking these talented students for help and these students not wanting to be disturbed whilst trying to do their own work,” he said. For the two students, website security was a priority, so they included user reviews and analytics to monitor who was using the site and what it was they were using it for. Mr Horton was so impressed with the boys’ initiative he requested the website be rolled out to all students in Years 4, 5 and 6. Have you considered ‘digital fasting’ for Lent?